Hello everyone! I thought I would squeeze in one more summer themed card. I think The Ice Cream Truck die is so cute! I wanted to use it before parking it in the garage for winter. I am sure you all have memories of hearing the familiar sound of the ice cream truck as it perused the neighborhood. While living in Tucson in the early 90's, I remember my young boys chasing the truck to buy a cool, sweet treat. Believe me, Tucson is the place to buy something cool during the heat of summer. Have a great week! I will be back next Monday. oh my goodness. This is yummy enough to eat! The colors are so tastey. We all scream for ice cream! I can remember ice cream trucks going by the house when I stayed with my aunt in Kansas City. That seems like so long ago, but what a great memory! Your card is sweet and yummy, and oh, so adorable! Great job, Janice!! 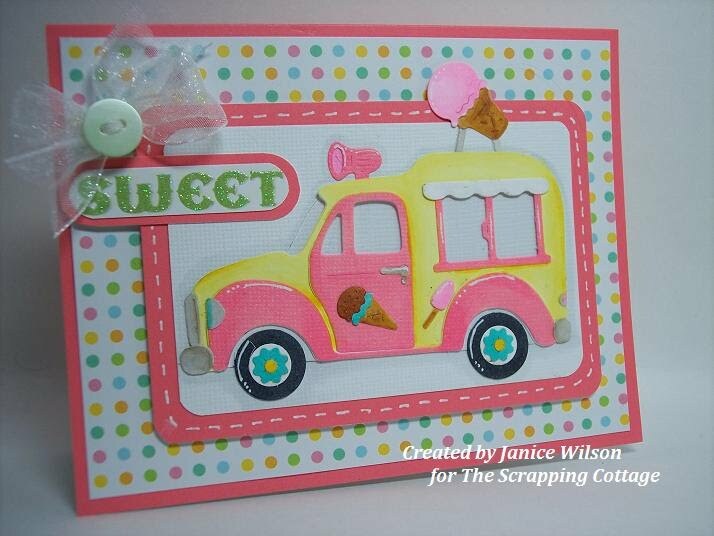 What a cute card Janice! Love the ice cream treat feel to it. I can just hear the sound of the ice cream truck when I was a kid! 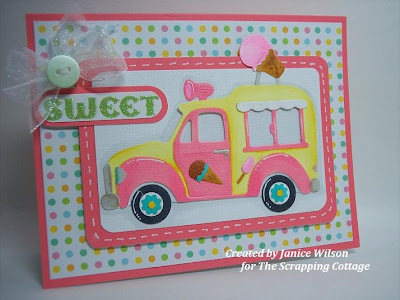 Your colors and papers on this card are so summery sweet!! I LOVE it!! Fabulous project today! !